Sandip Kumar holds an MA in Human Consciousness and Yogic Sciences from the Gurukul Kangri University in Northern India and Bachelor degree in Music from the Kurukshetra University. 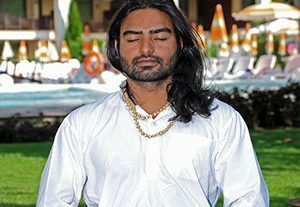 He has studied yoga, ayurveda, acupressure and other subjects in different Indian schools. He is a student of the famous guru Sadguru Jaggi Vasudev, founder of Isha Yoga Foundation and Swami Dev Murti, who taught him the secrets of ancient ayurvedic recipes and treatment methods. Expert in yoga, meditation practices acupressure and Darshan Cree. He was a yoga teacher in Haridwar with the currently famous in India Ram Dev. Sandip Kumar has conducted numerous meetings and seminars with politicians and students across India. In 2010 he visited Bulgaria at the invitation of The Bulgarian Yoga Federation and conducted yoga workshops in Sofia, Veliko Tarnovo, Pleven, Varna, and in various yoga centers. Since 2012 lives and works in Bulgaria. Sandip Kumar practices an ancient Indian method of bioenergy and acupressure. This method has a favorable effect with a number of diseases. It has helped many people to heal and change their lifestyle.